Gambling and betting markets are rapidly evolving, bringing user experience to a new level. The total gambling market capitalization today, according to multiple sources is worth an estimate of more than $400 billion and is showing great potential for growth, embracing new technologies and innovation. For the past couple of decades, everything has been moving toward being smart, starting from smart homes, moving to our daily lives with smart phones, smart watches, and smart cars. We’ve entered the wonderful age of optimization, where technology is aimed at tuning and adjusting existing systems in order to increase their productivity, elevate user experience, make them smarter and faster, and what is even more important – eliminate unnecessary components. This trend is supported and embraced by manufacturers around the globe. Blockchain is a fine example of tech that is currently changing the world. This technology is aimed at making transactions faster, safer and transparent. We are inspired by the idea of making betting effortless, enjoyable and profitable for all participants. 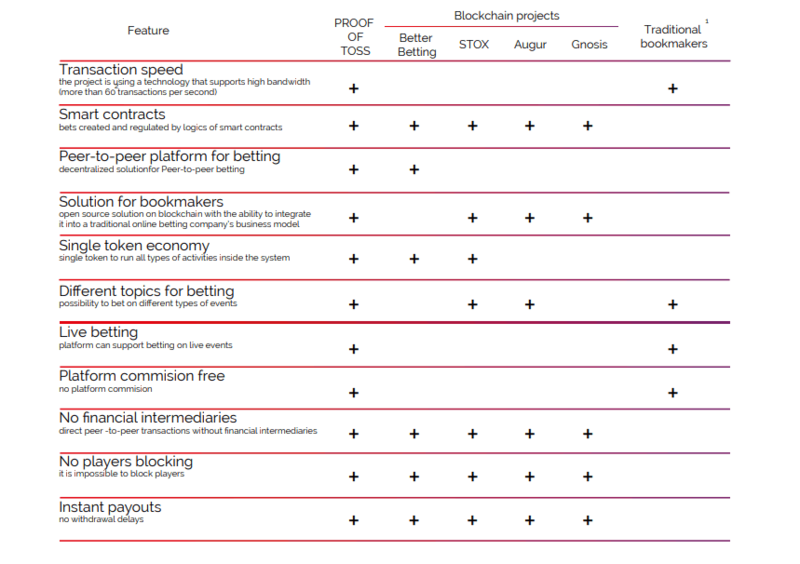 Powered by the blockchain, PROOF OF TOSS is an ecosystem for betting serving both as a peer to peer platform and an open source solution for professional bookmakers, sportsbook providers, and operators. PROOF OF TOSS is created for both market operators and players, both of whom are aimed at keeping their competitive advantage playing or creating as many interesting events as possible and having the opportunity to earn as much as they can. PROOF OF TOSS is a win-win solution for both. Our business vision: PROOF OF TOSS is an ecosystem for betting, that is developed for both the end-user (as a peer-to-peer platform) and companies supplying events on any scale. Everything is embedded in the logics of Smart Contracts, powered by RSK’s blockchain and fueled by TOSS tokens. Token: TOSS is a utility token of the ecosystem, that is used to create wagers, place bets and vote on results. All tokens will be issued only once at the amount of ~ 1,100,000,000 TOSS. Token sale: taking into consideration the complexity of our vision, we have established the Hard Cap at the level of 13 571 ETH, and the Soft Cap at 3 457 ETH. Since we are aimed at creating a fully functional ecosystem that will evolve and continue to grow, in case Soft Cap is not reached, all contributions will be returned to the token sale participants. Gambling and betting are part of a market that has truly gone online. Operators of this industry provide gambling and betting games such as poker, casino, sports betting, lottery and other games. According to Warwick Bartlett, chief executive of the Global Betting and Gaming Consultancy, the gross gambling yield reached more than $400 billion in 2017, with the value of betting of $58 billion. The most input to market growth is made by Asia and the Middle East followed by North America, Europe and Africa. Some of the major players operating in the market include 888 Holdings Plc., Bwin Interactive Entertainment AG, Ladbrokes Coral Group Plc., Playtech Plc., William Hill Plc., Amaya, Inc. and Paddy Power Betfair Plc. The rising popularity of online gambling and betting is rapidly transforming the overall dynamics of the global gambling industry. Consumers are shifting to the Internet to gamble and bet on sports. The global online gambling and betting market has witnessed rapid expansion across the globe in the past few years. We see this as a great market opportunity to tackle some key problems of the industry early on. According to market research done in 2017 82% of business owners are unsatisfied with the payment solutions that are available on the market. Payment restrictions and payment delays force them to look for new opportunities and solutions. Approximately 34% of businesses stated that the current online payment system demands unreasonably high fees for gambling and betting businesses. 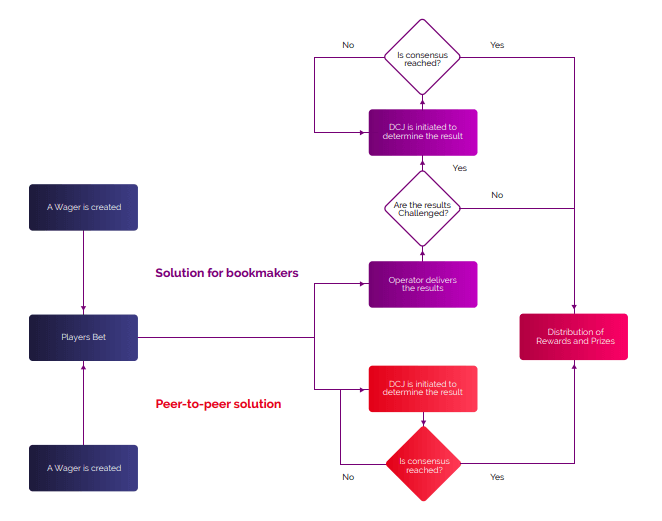 Approximately 19% of bookmakers argued that software failed to process transactions causing regular payment interruptions and delays. Moreover, an overwhelming majority is concerned about fraudulent activities in their systems. From the players perspective, we discovered high rates of dissatisfaction caused by dishonest bookmakers, bookmakers that cast a shadow on the whole industry. After analyzing market growth and market potential we determined that blockchain technology and the use of smart contracts may very well be an effective solution for the problems listed above. It is our goal to implement said technology and create one of the most widespread platforms for online betting. PROOF OF TOSS is a smart betting ecosystem of the new era, that is based on blockchain tech and smart contracts rather than on trust in a centralized party. All users of PROOF OF TOSS are protected by ironclad logics of Smart Contracts, blockchain cryptography and the internal Distributed Crowd Judging mechanism that is used to reach high levels of accuracy in defining and challenging the outcome of an event. PROOF OF TOSS PLATFORM.PROOF OF TOSS WEB WALLET.PROOF OF TOSS DCJ. PROOF OF TOSS MARKETING & PR. MARKETING FOR TOP PARTNERS. PROOF OF TOSS FOUNDATION. PROOF OF TOSS MOBILE APPLICATIONS .